» Forum » Tech » Tech: Alpha-numeric » Why is my pinbot freaking out? » Why is my pinbot freaking out? Why is my pinbot freaking out? When starting, it reboots like five times and then finally comes to normal. You can start a game, but three quarters of the music doesn't play. The displays kind of work - several of the same segments are stuck on when anything is displayed. So they're readable, but not working right. After a short amount of play, the game locks up. There may be a wiring problem with the insert lights as one or two of them come on when others come on. All sound effects work, all solenoids work, all switches work, GI is good. There's no battery damage on the board. Power supply was recapped. Work was done on the board to replace caps and resistors. Bench testing components seems to be good now. U26 and U27 ROMs were replaced. NVRAM was added. Pulling my hair out because I'd hoped that replacing some sketchy resistors on the board would have taken care of the problem. Nope. You can put the CPU into your F-14 game after switching the ROMs. This should isolate your issue to the CPU or a connector issue. What are your power supply voltages at the MPU? 5V and 12V? Sounds almost as if you have battery alkaline damage on the MPU. Can you post a picture of it? Sure - I think it's pretty darn clean. Installed an NVRAM very recently. Also the blanking LED is solid, +5VDC LED is solid, diagnostic LED is blinking fast. That blue axial capacitor C30 on the cpu board should be replaced along with the radial style electrolytic capacitors too. I just did - 4.8v not good enough I take it? What should it be? Pretty sure that got done too but I'll double check. Should be 5.0 volts. Pull off 1J-17 connector from the CPU board and retest the 5 volts on the connector itself (grey wires). 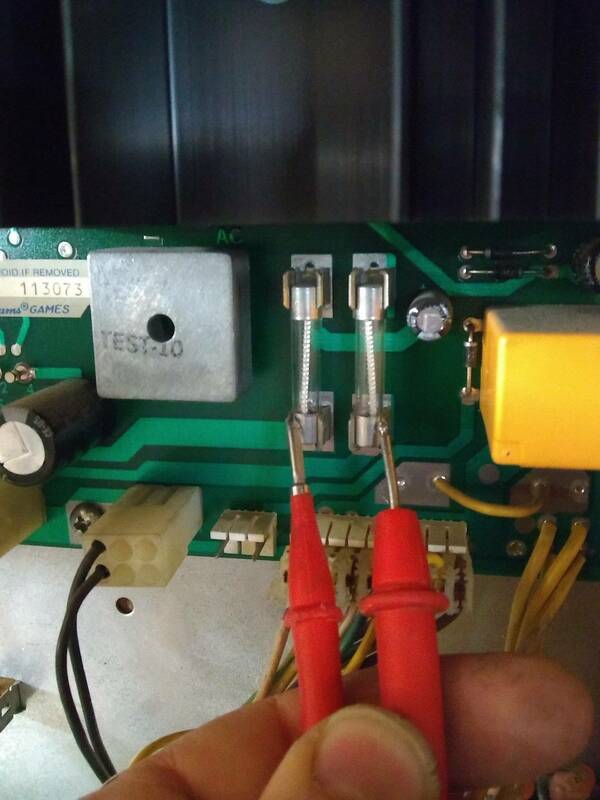 If it stays the same, then there is a trick to increase the output, if it is 5 volts now then you may need a new connector and header pins on 1J-17. I am getting 4.8 on the power board... I guess the upgrade didn't go as planned. I guess the upgrade didn't go as planned. Your upgrade is fine, but there are some tolerances on some parts that can affect the output. Now you output is steady at 4.8 which is good but too low. There is a resistor that gives a reference voltage to the voltage regulator chip which affects the final output. If you replace this resistor R-8 on the power supply with a different value you can raise the voltage output level. Give me some time and I can calculate a new value for you to raise the output .2 volts. Here you go, use a 1% metal film 5.23k resistor like this to replace R-8 on the power supply. This will bring up the voltage to @ 4.96 volts. Hey, that's fantastic thank you very much! your 12v is low. you should have about 12.9vdc on TP3 on the power supply to ground. on the MPU, the 12V ties into the reset circuit. Did you change all caps out when rebuilding power supply? how about the bridge rectifier? If Both the 5V and the 12v are low, Wouldnt it be better to find the cause of the issue, rather than mask it? 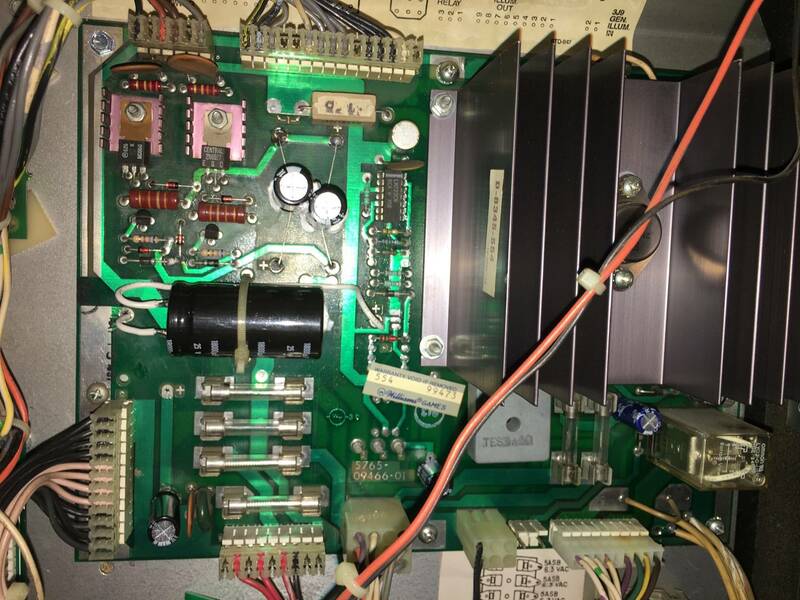 if there is another issue causing this, and you install a "trick" resistor, what happens if /when the original issue is repaired and the voltage comes up on a bunch of 30 year old components? Wouldnt it be better to find the cause of the issue, rather than mask it? I always want to fix the issue and not install a band aid, but as he stated, he has rebuilt the power supply, retested voltage with CPU disconnected with no increase in voltage. Meaning the CPU isn't dragging down the voltage and no loss at the connectors. Not much left but to change R-8. unless the AC supply connector to the PS is burned or cold soldered. What was done to rebuild the Power supply? If the AC is weak there, the 5V, which is derived from the 12v, which is derived from the tranformer supplied AC are all weak as well. so how about the 12v and the reset circuit? is 10.8 volts good enough to drive it ? enough to keep the game from booting over and over? Thats on the edge of a 10% tolerance. every power supply ive ever worked on i try to get under 5%. 5% of 5V is .25V or bottom end of 4.75. 5% of 12 V is .6 or a bottom end of 11.4V. It took me months to track down a problem just like this once. I had a power supply that I rebuilt and it was still reading 4.7 VDC... Long story short, I eventually found two resistors that HAD the WRONG COLOR bands on them. I tested them and they were installed at the Williams factory this way. Correct color bands, but much LOWER resistance values. So the fix came down to quality control issues from back in the 80's! Not saying that is your problem but it's worth checking all of there resistors for proper values. There are only about 10 of them. It could have been that those resistors had broken down. Resistors dont hold there value over a long period of time in use. A pinball Machine is not always powered on. Parts get hot and cool down. Expansion and Contraction. Values change. But if Im pulling out resistors, new ones are going back in no matter what i measure. Plus the heat on and old component while removing and re-installing. I understand this. It is not the case with the power supply in question. Although some of the resistors could have suffered from this deterioration and had the correct color bands, others on that same board HAD the wrong banded colors on them, and were installed from the factory that way. I have been doing this long enough to tell if a board came out of the oven that way, or if it had some components replaced at some point. The bands were incorrectly read from the factory in that case (grey for blue in that specific example). The lesson to be learned is not to assume the correct parts were installed from any factory producing boards. I understand this. It is not the case with the power supply in question. Although some of the resistors could have suffered from this deterioration and had the correct color bands, others on that same board HAD the wrong banded colors on them, and were installed from the factory that way. I have been doing this long enough to tell if a board came out of the oven that way, or if it had some components replaced at some point. The bands were incorrectly read from the factory in that case (grey for blue in that specific example). The lesson to be learned is not to assume the correct parts were installed from and factory producing boards. If it is true having the wrong resistors, what part locations are they? I have a couple of boards I need to check over. Easy Killer, I wasnt calling you a Liar, I said could have. In my time doing this I have never seen that. Doesnt mean it didnt happen. Ive Fixed hundreds of Williams power supplies. 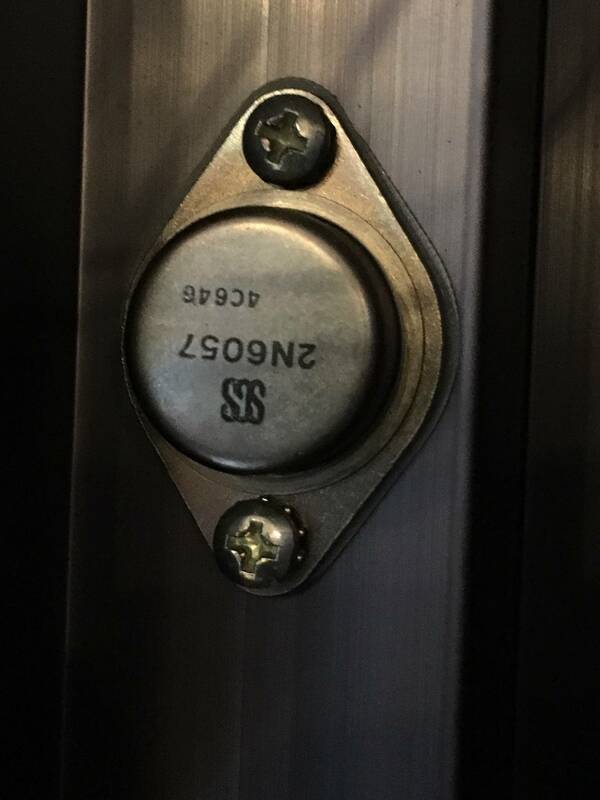 What game was the Resistor issue in question found on, or what game number was on the power supply serial number sticker? 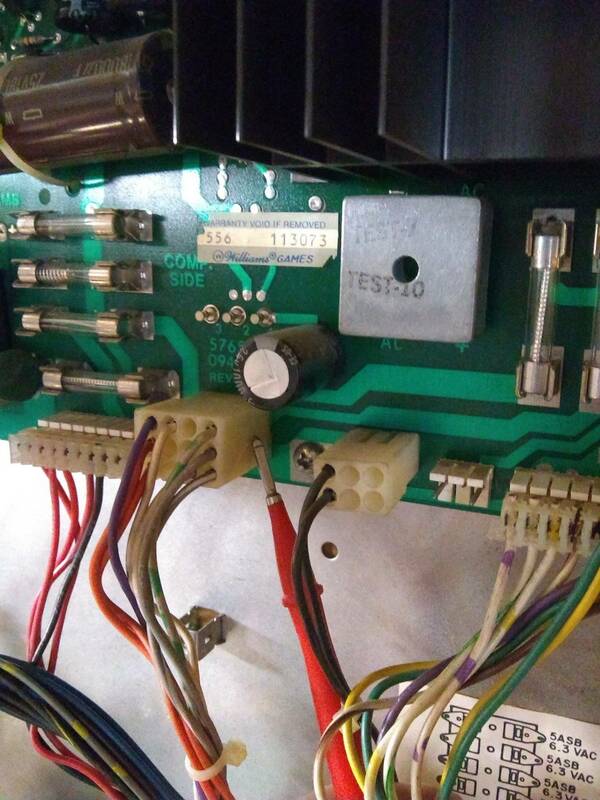 What game was the Resistor issue in question found on, or what game number was on the power supply serial number sticker? Not calling anyone out, just getting the facts out there to help others. The power supply was given to me to repair... I don't know if I still have it. I will check. I recall that it had a serial # on it and I think it was from Pinbot. I can PM you further details. On the power supply all the caps were replaced, and the 100v zener diodes were replaced with 91v. I don't remember if the BR was replaced but I don't think so. No resistors were replaced, that's for certain. 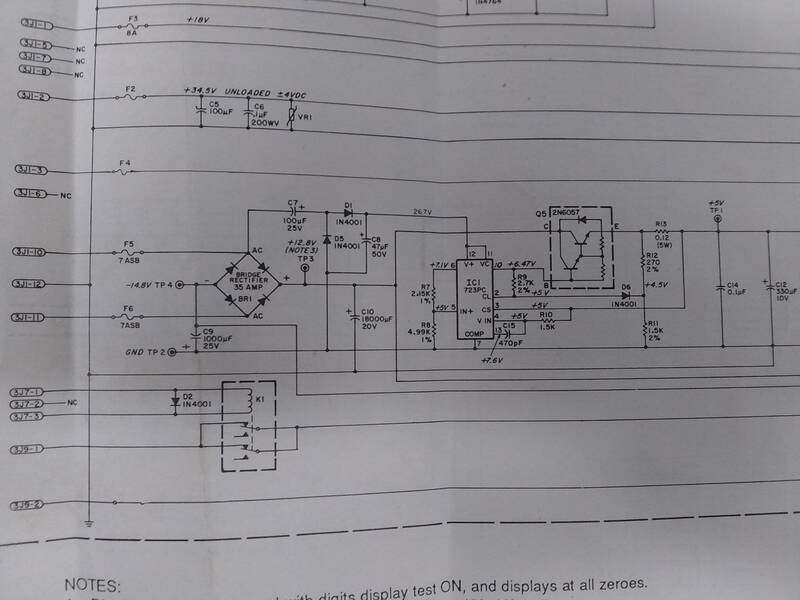 So I should measure input AC from the plug, at the transformer, power input to the power supply and TP3? Thanks everyone, discussions like this are what makes Pinside great. You can check the output of your F-14 power supply. If its closer to factory specs then swap the F-14 power supply into Pinbot and then retest the outputs again. If the outputs drop then you have a cabinet wiring issue. If the outputs remain the same then the problem has been isolated to the Pinbot power supply. I don't remember if the BR was replaced but I don't think so. Snap a pic of the power supply, I maybe able to tell if it has been replaced. There is nothing in the 12v circuit on the power supply, other than the bridge rectifier, with 2 Caps nearby. Asyou can see from the print, the 5v comes directly off of the 12v. 12v is down, 5V will be down. Also while you are here, make sure the fuses are seated and the holders are not loose. There is the potential for voltage drop on a loose fuse. If there is a discoloration(burnt brown) of this plug(meter lead) or if you pull the plug off and the base of the pins on the board is discolored on this side of the plug, you have an issue. I have picked up 1.5V on the 12VDC side just by Repairing this connection. you may have to replace pins or re-do the entire plug. Quoted from Jr99svt:There is nothing in the 12v circuit on the power supply, other than the bridge rectifier, with 2 Caps nearby. Last time I checked this is a unregulated half wave rectified,(BR1 bridge) filtered (C-10 cap) power supply. If 12 volts is not made on the power supply where does it come from? The caps(filter) have been replaced. The BR is nothing other than AC to DC. So, if the 12 v is low, IF the BR is good, the caps are new, what's left? The incoming AC from the transformer, going thru 2 plugs that I have repaired countless times, on hundreds of machines. That's where the 12 v comes from. It is ac rectified to DC. If you have a voltage loss on the input side, it effects everything down stream. Sure, the DC part of the circuit starts on the power supply, but the 12v and therefore the 5v circuits originate at the transformer. Both fuses read 10.43VAC and so does the pin on the power connector. I’m reading 120VAC input to the transformer so it looks like I need a new transformer? Pretty sure the BR isn’t new. Is your measurement taken with a lead on each of those fuses? Or a lead on a fuse and a lead on ground. What do the plugs under the Playfield look like? It looks to me like your BR is original. This is what a step down transformer does, 120 volts AC in 10 volts AC out. Nothing wrong here. Bridge rectifier is original and so is Q-5 transistor. It looks like only the caps were changed, but with the wrong type of caps. It should be 19-21vac at the bottom of both of those fuses, not 10vac. Unless he measured incorrectly, something is wrong there. Not incorrectly, just one winding at a time. When you add both winding's together you have 20.86 volts AC. Its called a center tap transformer. Nevermind, it's not worth it. It's all you Mr Grumpy. Go back to band aids. 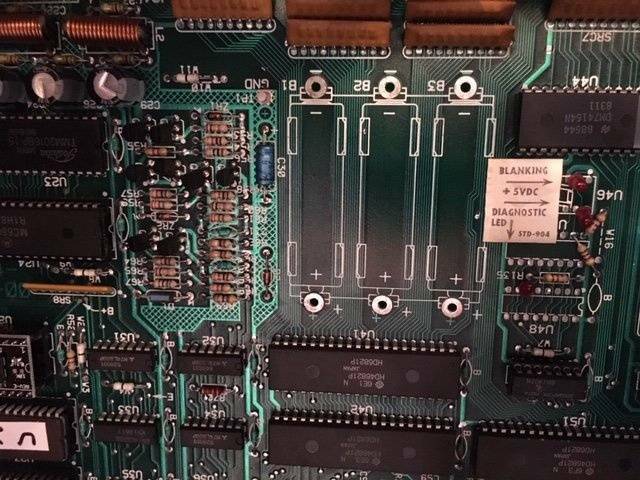 So I swapped out the 5765-09466-01 power board for the working one in my F-14 and the problems went away. So I'm going to try replacing the BR on the bad power board and see if that does it, unless anyone has better ideas? A scope on the output would tell us a bunch, like is there an open diode (ripple will be really bad) and if you are getting lower than normal 5 VDC, it may be acting like a half wave rectifier which would pull 12v down to about 10 or 11 and 5v down to 4.8 or so. Replace the bridge rectifier, it is probably exactly what is wrong. Well the F14 power supply only lasted about a week. I replaced it with a brand new rottendog. What is happening now is that the game starts but it is resetting a few seconds into play. Check the voltages while the machine is freaking out - I wonder if something is pulling down the 5 volts.